Filmmaker Anurag Kashyap, who recently got married in a private ceremony in Ooty to actress Kalki Koechlin, is busy promoting his new film Shaitan. Kashyap, along with debutant director Bijoy Nambiar and actor Rajeev Khandelwal, flagged off the Shaitan Hummer Ride that saw lead actors Neil Bhoopalam ,Shiv Pandit and Kirti Kulhari cruise on a Hummer at Mumbai's Mehboob Studio. Kalki Koechlin, who also stars in the film, was not present at the event. Kirti, who made her debut last year in Khichdi -- The Movie, looked stunning. Neil and Shiv were all smiles when it came to pictures with the Hummer. When asked about the film's title, Kashyap said it was inspired by what happens when a person is backed into a corner and how, in such situations, one's vices and inner shaitan come to the fore. He described Shaitan as 'edgy' and brilliant and added that the whole film was like a chase. Shefali Shah, who lost oodles of weight for her slim and glamorous avatar in Barnali Ray Shukla's Kuchh Luv Jaisaa, was present at the special screening of the movie, along with her co-star Sumit Raghvan. The second edition of India's first LGBT (Lesbian, Gay, Bisexual and Transgender) film festival, Kashish, began yesterday at Cinemax Versova in Mumbai. 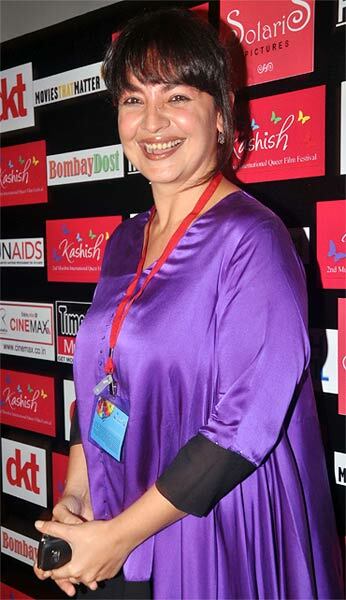 Filmmaker Pooja Bhatt was present at the event.